1. Heat large covered saucepot of salted water to boiling over high heat. Add ravioli and cook as label directs. Drain ravioli and reserve 1/2 cup cooking water; keep ravioli warm. 2. Meanwhile, cook bacon in microwave oven in single layer on microwave-safe plate as label directs; cool and coarsely chop. 3. In blender, purée peas, oil, mint, lemon juice, salt, pepper and reserved 1/2 cup cooking water. Transfer pea mixture to small saucepot. Stir in roasted red peppers and sun-dried tomatoes, and cook over medium heat 4 to 5 minutes or until heated through, stirring occasionally. 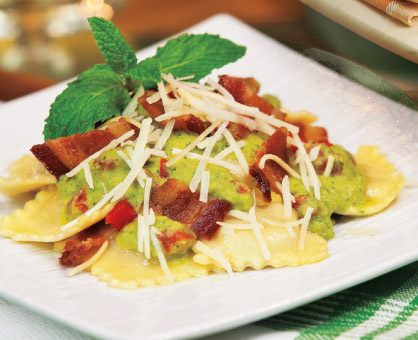 To serve, spoon sauce over ravioli; sprinkle with bacon and cheese. Garnish with mint sprigs, if desired.